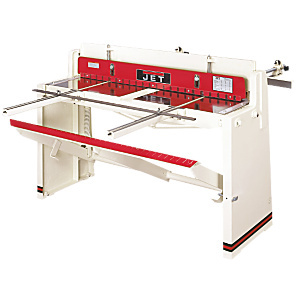 The JET FS-1652H Foot Shear is ideal for precision shearing of mild steel up to 16 gauge and a 52” capacity. Can also be used on aluminum, brass, copper, lead, plastic and zinc. Two-way blade configuration provides twice the cutting life. Upper blade is two-way; bottom blade is one-way. Features a 2° angle cutting edge and 1° face relief.